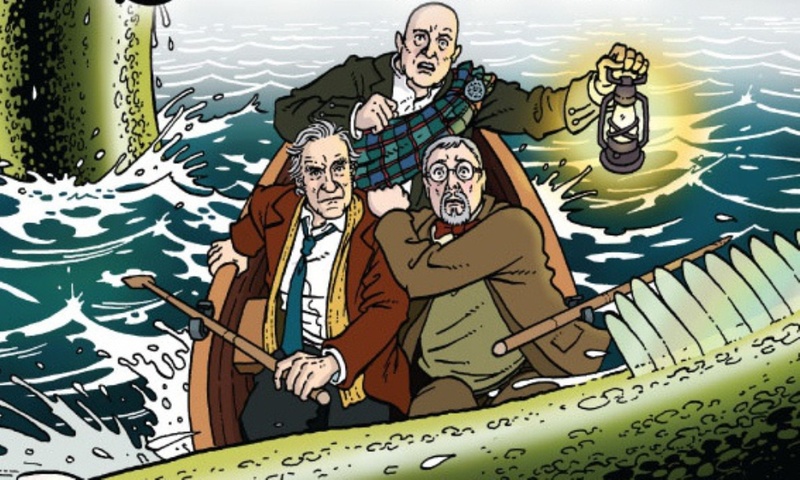 With The Horror of Loch Ness, Cosmic Hobo team Simon Barnard and Paul Morris not only take MI-13 up to Scotland, they also take them into uncharted territory: the first regular adventure for the new team of Sergeant Crow and Professor Dunning. The premise of The Horror of Loch Ness is as goofy as ever. In this one, a boat undergoing speed trials has disappeared, there’s a talking goldfish bowl, and there may or may not be something living in Loch Ness. Of course, things get more and more bizarre as the story goes on. Though the typical escapades are there, it has perhaps the loosest plotting of any of the Scarifyers stories that I can remember; though MI-13 never wins very purposefully, they feel extremely incidental to the climax of this one. The jokes are as good as ever (I loved the scenes with the old ladies), though I must say that the Back to the Future ones grated on my nerves for some reason. As you might imagine of a character played by David Warner, there’s no complaints to be made about Sergeant Crow. The new dynamic of Crow and Dunning is similar enough to Lionheart and Dunning to be just as entertaining, but different enough to not feel derivative — Crow, as you might imagine of a character not played by Nicholas Courtney lacks some of Lionheart’s charm, and listening to the crotchety ex-cop crab his way through the case is fantastic. Also delightful is the return of Aleister Crowley, the wickedest man in England. The world’s campest Satanist hasn’t appeared in The Scarifyers since The Devil of Denge Marsh (not counting one of the Christmas specials), and he’s just as hilarious as ever, whether he’s practicing his invisibility spells or just attempting to blend in with the locals. Let’s hope he reappears sooner than release number 12! I was delighted that Terry Molloy’s Dunning gets his own extended subplot in this one. Sometimes he’s shown a little too buffoonish for my tastes, but here he gets to be doddering yet brilliant in the way that only he can. Notably, this story features Philip Madoc in his last-ever performance. Unsurprisingly, he’s still great. His role seems to owe something to his part in the classic Doctor Who serial The Brain of Morbius (I say “seems to” because The Brain of Morbius is one of two Tom Baker stories I’ve not seen all of), and it’s good fun. As are, of course, all of the guest cast — no role is not played without unmitigated gusto. Though it might be my least-favourite Scarifyers story so far, that’s nothing to be ashamed of in a series with a quality level like this. The Horror of Loch Ness shows the Scarifyers have years of life in them to come, and I’m already anticipating the next release. The Horror of Loch Ness (by Simon Barnard, Paul Morris; starring Terry Molloy, David Warner) was released by Cosmic Hobo in June 2012.